Different pavement types use different types of joints and reinforcement to control the forces acting on the concrete pavement. These forces include drying shrinkage of the concrete, environment changes, and traffic loads. Forces due to shrinkage and environment changes are large enough in the concrete pavement to cause cracks to form without any traffic loading. The designer can select the location where the joints will be placed and, consequently, where the cracks will form. Joints may be thought of as “controlled cracks” that will reduce the stresses the concrete will experience during its life and greatly increase the life of the concrete pavement. Through the use of reinforcement, the location and spacing of cracks can also be controlled. Two types of concrete pavements commonly used in Texas are continuously reinforced concrete pavement (CRCP) and concrete pavement contraction design (CPCD), which is also called jointed concrete pavement (JCP). CRCP contains both longitudinal and transverse steel. CRCP does not contain transverse joints except at construction joints. 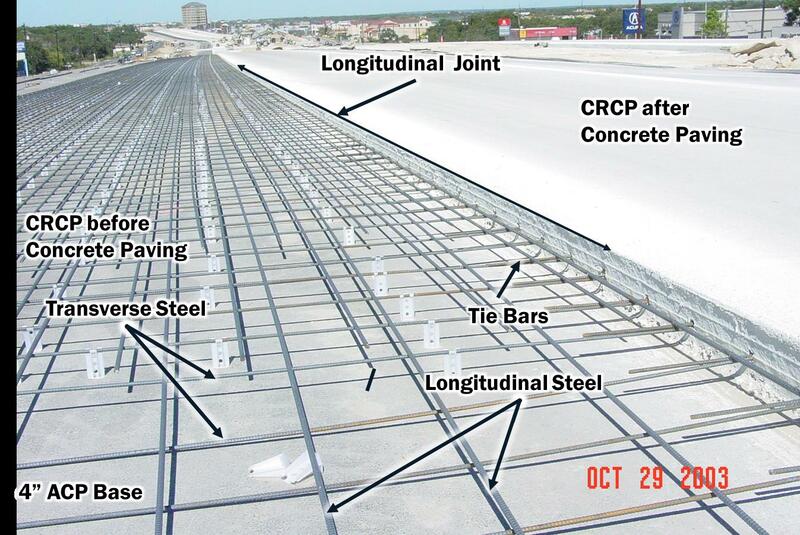 Figure 8-1 shows the typical reinforcing steel layout for CRCP. The function of the longitudinal steel is not to strengthen the concrete slab, but to control concrete volume changes due to temperature and moisture variations and to keep transverse cracks tightly closed. The function of the transverse steel is to keep longitudinal joints and cracks closed. If the steel serves its proper function and keeps cracks from widening, aggregate interlock is preserved and concrete stresses in the concrete slab due to traffic loading are reduced. The CRCP thickness design is detailed in Section 2, Approved Design Method, and Section 3, Rigid Pavement Design Process for CRCP. Steel reinforcement and other design details are governed by the CRCP standards. The latest CRCP standards can be obtained from the department’s internet website at the following address: http://www.dot.state.tx.us/insdtdot/orgchart/cmd/cserve/standard/rdwylse.htm. Some districts have district-wide CRCP standards. Figure 8-1. Continuously Reinforced Concrete Pavement. CPCD has transverse joints spaced at regular intervals. The transverse joints are used to control temperature-induced contraction and expansion in the concrete. Smooth dowel bars are used at the transverse joints for load transfer. The transverse joints are spaced at 15 ft. intervals. Longitudinal joints are used to control random longitudinal cracking. Longitudinal joints are tied together with tie bars. Figure 8-2 shows the typical layout for CPCD. The thickness design of CPCD is detailed in Section 2, Approved Design Method, and Section 4, Rigid Pavement Design Process for CPCD. Other CPCD details are governed by the concrete pavement contraction design (CPCD) standards that can be obtained from the department's internet website at the following address: http://www.dot.state.tx.us/insdtdot/orgchart/cmd/cserve/standard/rdwylse.htm. Figure 8-2. Concrete Pavement Contraction Design. For intersections and approaches in flexible pavement roadways that are associated with vehicle braking and acceleration which could cause shoving and rutting of an asphalt pavement. Table 8-1 recommends applicable concrete pavement types for particular situations. Consult the Maintenance Division, Pavement Asset Management Section, staff when considering CPCD pavements for situations not covered by the above criteria. 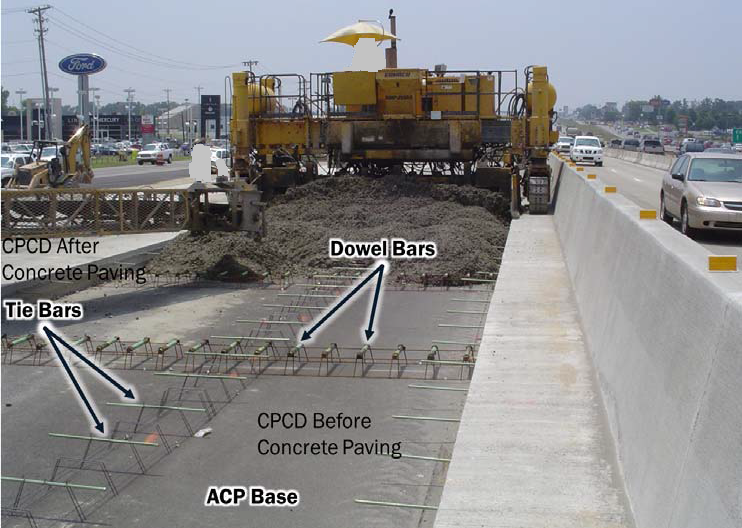 Rigid pavement types other than CRCP and CPCD may be appropriate for a wide variety of situations. Refer to Section 7, “Bonded and Unbonded Concrete Overlays,” and Section 8, “Thin Concrete Pavement Overlay (Thin Whitetopping),” for a description of other rigid pavement applications. For rigid pavements, the initial pavement structure shall be designed and analyzed for a performance period of 30 yr. A performance period other than 30 yr. may be utilized with justifications. For example, an existing pavement to be widened will be completely reconstructed within 15 yr. In this case, a selection of a 15-yr. performance period is more reasonable and justifiable for the widening. There is substantial evidence that tied Portland cement concrete (PCC) shoulders improve PCC pavement performance significantly. Therefore, use tied PCC shoulders. If it is not feasible to provide full-width tied PCC shoulders, use a minimum 2-ft. widened outside lane. PCC shoulders should be tied to the main lane pavement by tie bars or by the main lane's transverse steel. The PCC shoulder must have the same thickness and the same base layers as the main lane pavement. This will allow traffic to be routed on the shoulder during future maintenance and construction while reducing the chances of structurally damaging the shoulder. It will also facilitate the construction sequence, in most cases. Tied or monolithic curb and gutter help in reducing edge stresses and serve as a barrier that discourages traffic from riding too close to the edge of the pavement structure. Although tied curb and gutter sections usually contain tie bars, the tie bars are too small in either size or number to transfer load stresses effectively by themselves. Construction joints usually exist between tied curb and gutter and the concrete pavement. This means no aggregate interlock exists. Since the number of edge stresses in the pavement are much less for monolithic curb sections than for tied curb and gutter sections, the use of monolithic curb is recommended when practical.